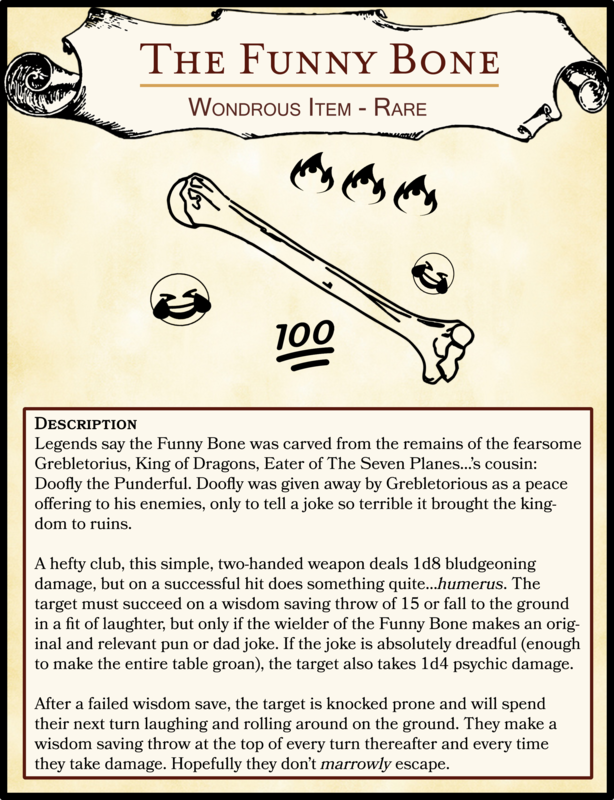 Legends say the Funny Bone was carved from the remains of the fearsome Grebletorius, King of Dragons, Eater of The Seven Planes…’s cousin: Doofly the Punderful. Doofly was given away by Grebletorious as a peace offering to his enemies, only to tell a joke so terrible it brought the kingdom to ruins. A hefty club, this simple, two-handed weapon deals 1d8 bludgeoning damage, but on a successful hit does something quite…humerus. The target must succeed on a wisdom saving throw of 15 or fall to the ground in a fit of laughter, but only if the wielder of the Funny Bone makes an original and relevant pun or dad joke. If the joke is absolutely dreadful (enough to make the entire table groan), the target also takes 1d4 psychic damage. After a failed wisdom save, the target is knocked prone and will spend their next turn laughing and rolling around on the ground. They make a wisdom saving throw at the top of every turn thereafter and every time they take damage. Hopefully they don’t marrowly escape.